Explorations and Surveys for a Rail Road Route from the Mississippi River to the Pacific Ocean. War Department. Route near the 41st Parallel. Map No. 4. 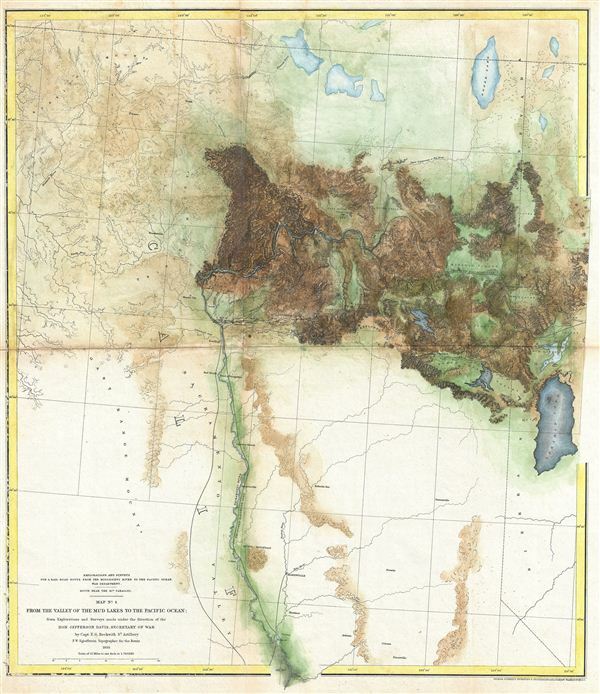 From the Mud Lakes to the Pacific Ocean; from Explorations and Surveys made under the direction of the Hon. Jefferson Davis Secretary of War. This is a rare and important 1855 map of parts of California prepared for the Pacific Railroad Survey. Covers from Pyramid Lake to the Sacramento River. Extends north to the California border and south as far as Fremont and Marysville. Offers superb topographical detail – most attributable to the expedition topographer F. W. Egloffstein. This is the fourth of a series of four maps drawn and surveyed By Captain E. G. Beckwith with the intention of determining the best route for a railroad from the Mississippi to the Pacific. Delineates two proposed railroad routes through the Sierra Nevada Mountains. The proposed lines runs northwest from the Valley of the Mud Lakes to the Madelin Plains and then westward along the Pitt River towards Shasta City, where it turns south along the Scaramento River. Also notes an earlier southerly route proposed route explored in 1854. Notes Mount Sahsta, Red Bluffs, Marysivll, Auburn, and the head of Navigation on the Sacramento River. The southern part of the map details part of the California Gold Region, including Nevada, Auburn, Colima, Pacerville, Marysville and Fremont. Prepared under the direction of Secretary of War Jefferson Davis by Captian E. G. Beckwtih and F. W. Egloffstein. Engraved by Selmar Siebert in Washington D.C.
Rumsey, 0693.031. Wheat, C., The Mapping of the Transmississippi West, 1540-1861, #825. Library of Congress, Map Division, G4361.P3 1855 .E34 RR 168. University of Nevada, Las Vegas, Map Division, G4051.P3 1855.E553 no.4 c.2.